Andrew Jackson (1767–1845) was the seventh president of the United States. He symbolized the democratic advances of his time, while strengthening the power of the presidential office in American government. Andrew Jackson was born on March 15, 1767, in Waxhaw country, which is now part of North and South Carolina. His father, who died shortly before Andrew's birth, had come with his wife to America from Ireland in 1765. Andrew attended several academies in the Waxhaw settlement, but his education was incomplete and he never developed a taste for learning. camp. When Jackson refused to clean an officer's boots, the officer slashed him with a sword, leaving a permanent scar on his forehead and left hand. Jackson was the only member of his family to survive the war. Many believe that his harsh, adventuresome, early life developed his strong, aggressive qualities of leadership, his violent temper, and his need for intense loyalty from friends. After the war Jackson drifted from one job to another and from one relative to another. He wasted a small inheritance and for a time lived a wild and undisciplined life. Then, in 1784 Jackson left for Salisbury, North Carolina, where he studied law in a local office. Three years later, after earning his law license, he moved to the western district that eventually became Tennessee. Living in Nashville, Tennessee, Jackson soon became a distinguished lawyer. Within ten years he became one of the most important landowners in the state. He also achieved social status by marrying Rachel Donelson (1767–1828), the daughter of one of the region's original settlers. In 1796 Jackson represented his county when the Southwest Territory (areas west of the Mississippi River) petitioned Congress for admission as a state to the Union, as the United States was known. Although he played a modest, or small, part in the proceedings, one tradition does credit him with suggesting the name of the new state: Tennessee, taken from the name of a Cherokee Indian chief. After Tennessee was admitted as the sixteenth state of the Union, Jackson was elected to its only seat in Congress. The following year he became judge of the Superior Court of Tennessee. He resigned from the bench in 1804 to devote himself to his plantation, where he later built a graceful mansion called the "Hermitage." Jackson's life would change when, once again, war erupted between America and Great Britain in the War of 1812 (1812–15). Jackson had achieved the rank of major general (an officer in the military who is above a brigadier general) of the Tennessee militia (a small military force that is not part of the regular army). He and his militia were ordered to overpower the Creek Indians in Alabama, who had massacred white settlers at Fort Mims. At the Battle of Horseshoe Bend (1814) Jackson dealt the Creek a crushing defeat. During this battle Jackson's men recognized his toughness and strong will by nicknaming him "Old Hickory." When the U.S. government heard rumors of a British attack of the South through one of the ports on the Gulf of Mexico, Jackson was ordered to block the invasion. The British attacked on January 8, 1815, and were easily defeated. More than two thousand British soldiers were killed, while only thirteen Americans were lost in battle. Jackson became a national hero overnight, for he had given Americans confidence in their ability to defend their new freedom. When the war ended, Jackson returned to his plantation. However, he soon resumed military duty to successfully overpower Indian forces along the southern frontier of Spanish Florida. After President James Monroe (1758–1831) purchased Florida from Spain for $5 million, Jackson served as governor of the Florida Territory. He quit after serving only a few months. His accomplishments served to increase Jackson's popularity throughout the country. Meanwhile his friends in Tennessee began talking about the possibility of making him a presidential candidate. First, he was elected to the U.S. Senate in October 1823. The following year, four candidates sought the presidency, each representing a different section of the country: Jackson of Tennessee, William H. Crawford (1772–1834) of Georgia, John Quincy Adams (1767–1848) of Massachusetts, and Henry Clay (1777–1852) of Kentucky. It was a close election, and the House of Representatives had to decide the winner. When John Quincy Adams was chosen president, Jackson was convinced the election was fixed and that there was a "bargain" between Adams and Clay. For the next four years Jackson's supporters attacked the Adams administration with the accusation of a "corrupt bargain." In the election of 1828 Jackson won an overwhelming victory. During the campaign, Martin Van Buren (1782–1862) of New York and John C. Calhoun (1782–1850) of South Carolina joined forces behind Jackson. Jackson and his supporters soon became known as the Democratic Party. Supporters of Adams and Clay were now called National Republicans. Relations between President Jackson and Vice President Calhoun soon turned sour. The two argued over the important constitutional question of the nature of the Union. Calhoun strongly believed in a state's doctrine (official statement) of nullification, or the right of a state to undo any federal law that disagreed with the state's views. Jackson strongly believed nullification was wrong and could weaken the Union. Calhoun wound up resigning before the end of his term. The presidential contest of 1832 revolved around the important political issue of the national bank, or the bank controlled by the national government. Jackson believed the Second Bank of the United States (established in 1816) was unconstitutional, or that it disagreed with the nation's rules. Also, Jackson maintained that the Bank had failed to establish a sound and uniform currency, or money that could be used across the country. When the Bank applied to Congress to continue its work, Jackson vetoed (rejected) the bill. Although the bill would pass in the end, Jackson sent a strong message by saying how "the rich and powerful too often bend the acts of government to their selfish purposes." With this message Jackson broadened presidential power by giving social, political, and economic reasons for vetoing the bill. In the 1832 presidential election Jackson and vice presidential candidate Van Buren defeated Henry Clay. 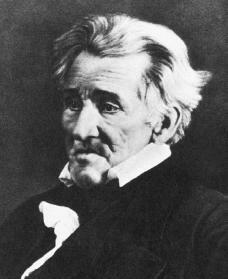 Jackson then informed Congress of his intention to pay off the national debt. This goal was achieved on January 1, 1835, thanks to income the federal government received from land sales and tariffs (import taxes). Jackson supported a policy of "rotation" with respect to Federal offices. He declared that no one man has more right to office than any other man. Jackson also supported moving Native Americans west of the Mississippi River as the most humane, or fair, policy the government could pursue in dealing with the Native Americans. Jackson signed more than ninety treaties with various tribes, in which lands owned by Native Americans within the existing states, were exchanged for new lands in the open West. Another issue in Jackson's second term was that of tarriffs. The North called for high rates, but the South considered them a way of financially supporting northern manufacturers at the expense of southern businesses. With the passage of the Tariff of 1832, which reduced the import taxes but not enough to satisfy southern states, South Carolina reacted violently. The state called on Calhoun's doctrine of nullification and soon declared the tariffs of 1828 and 1832 null and void. The state then warned the federal government that if force were used to execute the law, the state would secede, or withdraw membership, from the Union. Jackson would not back down, and threatened the state with treason, or a high crime against one's country. A compromise tariff was soon hurried through Congress. Jackson had avoided a national crisis, and his actions during the controversy were masterful. Through the careful use of presidential powers and compromise, he preserved the Union and upheld the power of federal law. At the end of his two terms in office, having participated in the inauguration of his successor, Martin Van Buren, Jackson retired to his plantation. He continued to keep his hand in national politics until his death on June 8, 1845. Booraem, Hendrik. Young Hickory: The Making of Andrew Jackson. Dallas: Taylor, 2001. Collier, Christopher, and James Lincoln Collier. Andrew Jackson's America, 1824–1850. New York: Benchmark Books, 1999. Judson, Karen. Andrew Jackson. Hillsdale, NJ: Enslow, 1997. Meltzer, Milton. Andrew Jackson: And His America. New York: Franklin Watts, 1993. Remini, Robert V. The Life of Andrew Jackson. New York: Harper, 1988. Whitelaw, Nancy. Andrew Jackson: Frontier President. Greensboro, NC: Morgan Reynolds, 2001.